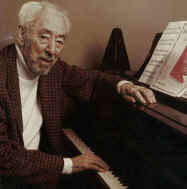 Best remembered for seasonal favorites like "Rudolph, the Red Nosed Reindeer," composer Johnny Marks was born in Mt. Vernon, NY on November 10, 1909. After attending Columbia University, he studied music in Paris, returning stateside to work as a radio producer; during World War II, Marks additionally produced entertainment for American troops stationed overseas. 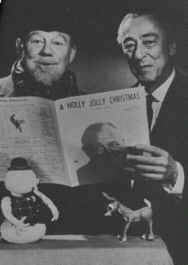 In 1947, he was asked to write a song based on "Rudolph, the Red-Nosed Reindeer," a poem written by his brother-in-law Robert L. May, a copywriter with the Montgomery Ward department store chain. Ward's had already given away six million illustrated copies of May's story before Marks even composed a note, but the song itself (popularized by Gene Autry's 1949 recording) still sold over 30 million copies in the decades to follow, inspiring a beloved television special which premiered in 1964. Marks was named to the Songwriters Hall of Fame, he died September 3, 1985. ASCAP lists 94 songs to Marks' credit. For more information about Mr. Marks, including a discography, see the Songwriters Hall of Fame. Marks also wrote a number of other songs, some of which were performed in the animations of Rudolph the Red-Nosed Reindeer, including Why Am I Such a Misfit, We’re a Couple of Misfits, We’re on the Island of Misfit Toys, There’s Always Tomorrow, and Fame and Fortune.